Steve Jobs of Apple had asked to give the book - Autobiography of a Yogi by Paramahamsa Yogananda – as a last gift to all who attended his memorial service. I am half way through the book. But I am finding it difficult to complete it due to references to miracles in that book! What aspect of the book, Steve Jobs - one of the most respected men in modern technology, found inspiring – I am yet to find out. No matter however modern we become, there are some aspects of our belief systems, which cannot be explained in the realms of logic. Belief in holy spirits is one of such kind. Recently premiered documentary series – Belief – in Discovery Channel is a testimony to such beliefs all around the world! Bhuta Kola, explained in one of my earlier posts, constitutes the belief system of people of coastal Karnataka for several centuries. What are Bhutaradhane and Nagaradhane? – Bhutaradhane or Daivaradhane is a form of worship of holy spirits (called Bhuta or Daiva), followed by the people of coastal Karnataka in India. But it is not restricted to this region. Neighboring Kerala state too follows this tradition, where it is called Theyyam! Holy spirits could be of totemic (relating to forces of nature), divine or human origin. Perfomer or Patri invokes the holy spirits during the ritual which is known as Bhuta Kola. Nagas (serpent gods) are worshiped in a similar way and this form of worship is known as Nagaradhane. Akin to Bhuta Kola, ritual here is called Nagamandala, which depicts the union of male and female snakes. This is performed by two priests – Patri(male form) and Nagakannika(female form). Interestingly, even this ritual has an equivalent in Kerala, where it is called Sarpam Thullal. So, the worship of Daivas (Daivaraadhane) and Nagas (Nagaradhane) are an important aspect of not only coastal Karnataka but of Kerala state too. Democratic Tradition: Bhuta's are worshipped by people of almost all castes of Hindu religion in this region and in some places, they are also worshiped by Muslims. Both Hindus and Muslims offer prayers to Ali Bhuta at Padangala Bhagavathi Shrine in Pare village near Kumble in Kasargod district, Kerala. Performer of the Kola (called Patri) belongs to the Scheduled Caste/Tribe, who is revered by the worshipers. Thus, it is in contrast to the Dalit suppression elsewhere in India. It is another matter that though revered during the times of Kola, they are not cared rest of the times. Shivadhwaj Shetty, a Kannada actor, who hails from Kasaragod made a movie on this irony, named Gaggara (meaning anklet of Bhuta, worn by the performer during the performance), which went on to win the national accolades. Non-Vedic Form of Worship : Vedic priests follow vegetarianism. But the offerings to Bhuta’s can be of animal origin. Some Bhutas are also offered alcohol during the worship. This is in contrast to Vedic traditions and represents an alternate form of worship in India. This local tradition connects the people with their own land. But the rituals are not entirely different. If you closely observe the Bhuta Kola, it would seem like a merger of Vedic and non-Vedic rituals. Bond of Togetherness: Bhuta Kola is performed every year during the specified time. For a group of families, which hail from a common ancestry, this is the time when everyone gets together. People come together forgetting their differences and take part in the Daiva Seve(service to the holy spirits). Famous Temples and Shrines of Daivas and Naga: Panolibail in Bantwal Taluk of Dakshina Kannada district is one of the most revered Daiva shrines. Kallurti or Satya Devate is the presiding deity here. Apart from the exclusive places of worship for Daivas, many temples of coastal Karnataka have dedicated Bhuta sthana’s(shrines for holy spirits) in their premises. Famous pilgrimage center, Dharmasthala has shrines dedicated to Dharma Daivas. Puttur Mahalingeshwara Temple too has a shrine or gudi dedicated to the Daivas. Also, naga's (serpent god) are worshiped within the temple. This indicates that these forms of worship are an integral part of Hindu religion in the region. The Belief : Though people from this region are well known for adopting modern technologies and a modern way of life, they are also deeply religious. People who left Mangalore for greener pastures, make sure they visit the Bhuta Sthanas in their native particularly during Bhuta Kola. So, what makes them come back to their place of origin? The answer lies in Ashtamangala Prashne. Ashtamangala Prashne (Ashtamangala Prashnam in Malayalam) is a practice in Hindu astrology which is used to find the causes and remedial measures for the problems faced by the family members most probably because of not worshiping the Daivas. It deals with horary astrology, in which an astrologer attempts to answer a question by constructing a horoscope for the exact time at which the question was received and understood by the astrologer. Also, Ashtamangala Prashne involves eight auspicious items namely ghee lamps (brass lamps with a wick in clarified butter), mirror, gold, milk, yogurt, fruits, book, and white cloth. I have heard people returning to their place of origin(moola sthana) after finding the answers for their queries in Ashtamangala Prashne. People seemed to find solutions and peace of mind after attending the Prashne and performing the required riturals. A family from Sagara of Shivamogga district visits Baje village of Kasaragod to attend the pooja rituals of their family deity. Families who hitherto did not know their family deity could find it through Ashtamangala Prashne. They built a shrine at the moola sthana and conduct pooja’s/nema’s regularly. Deva and Daiva (God and Holy Spirit) : It is said that Deva(God) forgives the mistakes committed by his devotees or people in general just like a mother forgives her children. In contrast, Daiva is believed to punish the wrong doers and set things right for the believers, that too very quickly. This belief is so strong that it is said that the people from Tulu Nadu believe in their Daiva's more than their Deva's. This widely accepted belief is believed to instill fear in the minds of people who are about to do bad acts. Worshiping by Celebrities : Celebrities who made it big outside of Mangalore in cities like Mumbai, Bangalore and Hyderabad do visit their native place and take part in the Bhuta Kola. Following are the list of such events reported in media. These visits have also influenced the belief system of the people, which is already very strong. Shilpa Shetty : Bollywood actress Shilpa Shetty along with her actress sister Shamita Shetty visited her hometown at Mudalady near Niddodi(close to Kateel) to attend the Kola of family diety Jarandhaya. Anushka Shetty : Famous Tollywood actress Anushka Shetty, visited Urvalu village of Puttur Taluk to attend Bhuta Kola. Ravi Shastri : Cricketer Ravi Shastri has been visiting his native Karvalu village in Karkala for many years now. He makes sure to visit Nagabana. Apart from this, Kukke Subramanya Temple near Mangalore has attracted high profile visitors. Naga(serpent god) is mainly worshipped here. Cricketers - Sachin Tendulkar, VVS Lakshman and N Srinivasan(former president of BCCI), business tycoon Vijay Mallya, Dharam Singh(former chief minister of Karnataka), Natwar Singh(former External affairs minister, Govt of India) – have all visited the Kukke Subramanya Temple. Recently Bollywood actor Ajay Devagan performed poojas at the Temple. Over the years, I have seen many shrines of daivas which were in a state of neglect being renovated. In recent times, new shrines have been built and daivas are being worshiped with grandeur. 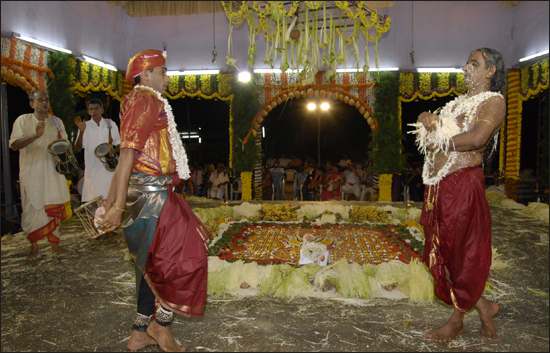 Thus, centuries old form of worship continues to hold the attention of people from Tulu Nadu for years to come! Very extensive research u have done!!! Very well written. Yes even I used to think.. No matter how well educated or forward thinker or wealthy.. People do follow bhoota kola custom!! Great insights here. Even though there is strong belief system, nowadays I view them as folklore than worship. That doesn't mean I hamper the belief system. Thanks Nanda Kumar for your frank opinion! I checked the video. It is quite comprehensive shoot of Bhuta Kola. @Manjunatha, Yes indeed culture can be a cohesive force in society! Good to know the similar tradition elsewhere in Karnataka! Interesting topic Raveesh. But the plain truth is that there's no right or wrong analysis for these beliefs. End-of-the day we are controlled by a supreme power and have our own typecasted version of believing it. Thanks Sandeep for the elaborate comment. Yes, I agree your point on there is right or wrong analysis. Also, if you observe the comments I got, they are from both ends i.e from those who wonder why it is not logical and those who accepted with a open heart, indicating the balanced view of things in the article. What I have also realized that these traditions are peaceful ways of coexistence of communities. They are local and connect people to their land. Also, I will check your write up on Karaga. Had a glance, looks comprehensive and interesting! Is there any other name for Nagakannika (female snake god)? I don't know of any other name for Nagakannika. Mr. Raveesh Kumar, appreciate your good work. Contact me through email, riteshkotian@gmail.com. Ee Dane Mulu, Yeregavuye Kirikiri? What to do when a NEFT Transfer fails?